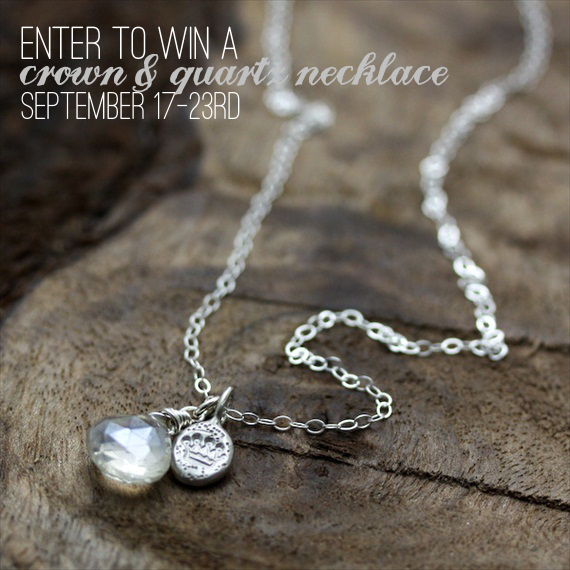 Home | Giveaway: Win a Crown and Quartz Necklace! Winner announced! 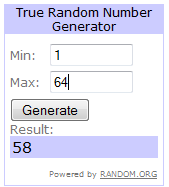 And the winner is… lucky #58! Congrats, Kaleigh: check your inbox for details on how to claim your beautiful crown and quartz necklace. Thanks to all who entered and a big thank you goes out to Andrea for sponsoring this giveaway! This necklace measures 18″ long and features an iridescent quartz briolette and a handmade recycled sterling silver charm. The charm – deeply stamped with a crown and stardust sparkles – is a truly unique piece, worthy of being worn down the aisle. Between September 17th through September 23rd (11:59pm EST), enter for a chance to win a crown and quartz necklace! Simply visit Andrea Bonelli.com and view her entire collection. Return here and comment on a piece you love from the collection. You may enter with a comment once per day for one full week. You may enter up to four times daily using one method above once per day (comment, Facebook, Twitter, Pinterest). One (1) lucky winner will be randomly selected using random.org and announced on our blog on September 24th. Winner will also be notified via email. 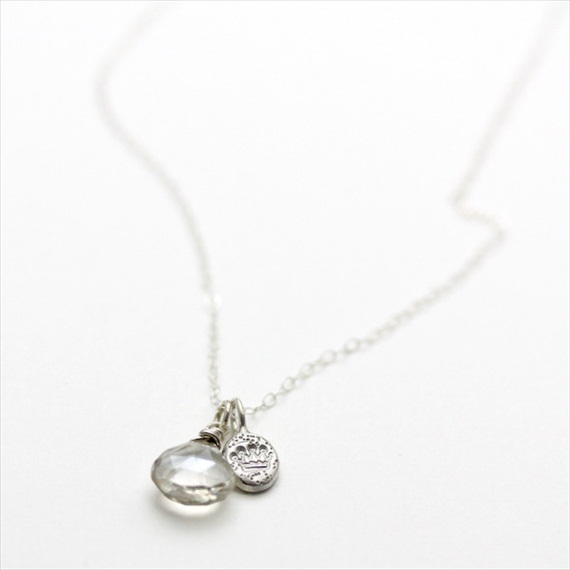 Winner will receive one (1) crown and quartz necklace, shown above, handmade by Andrea Bonelli Jewelry. Necklace takes 2-3 weeks to fabricate. Past giveaway winners within thirty (30) days not eligible to win. Entries received through September 23rd 11:59pm EST. No purchase necessary. Andrea Bonelli Jewelry is a Featured Artisan at Emmaline Bride! Apply with Emmaline Bride + find out how to sponsor a giveaway with us! Love the morganite bead ring and the stardust dome necklaces!! I love the Gold Rough Rock Pebble Studs! I like the stardust necklace! I really love the stardust dome necklace in silver! It looks like it would be a great gift to give to the maid of honor! I love the ring necklace! I ADORE this necklace and am looking for something to wear with my wedding dress in a month!!! I would LOVE to win!!! I’m absolutely in love with her moissanite bead ring engagement ring. Her design is gorgeous and her use of earth friendly stones and metals is commendable. Crossing my fingers I might have it on my ring finger one day! LOVE the 14k gold moissanite rustic ring! Gorgeous… Also, love that shipping is flat 5.95!!! The morganite bead ring is beautiful! I love te ridged necklace! Awesome! is it also open outside US?Hope to win one of the necklace. I love 14k gold moissanite studs and the Crown and quartz necklace. I love the stardust studs! Shared this awesome giveaway with my friends on Facebook! I like the hammered rustic cuff. love the rose cut cognac ring! I love the stardust band, so pretty and classy! I love the simplicity of the 14k gold moissanite studs! So pretty & classy! I love the 14k gold moissanite studs! Cute collection! love the 14k gold textile cuff!! This necklace is absolutely beautiful! I am in love with the faceted labradorite cocktail ring. Such pretty colors! I love the circlet necklace. Simple and cute! stardust studs are to die for! I am in LOVE with the Moissanite Rustic Ring. Fabulous work. I love the organic pebble studs, and the Crown and quartz necklace. The faceted labradorite cocktail ring is gorgeous!